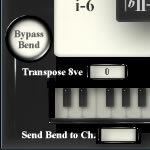 Midi coming into Playa on channel 1 can be turned into chords or scale-locked melody and output to the channel of your choice. 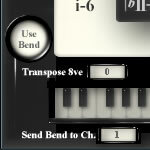 The bass note of the chord can be sent to a separate channel for use with multi-timbral instruments. ...to resume its original function. All channels other than 1 will be scale-locked by Playa and output to their input channel. This means that more than one Midi keyboard can be scale-locked by Playa. You can jam with other musicians, all dynamically locked to the same scale as the harmony player.